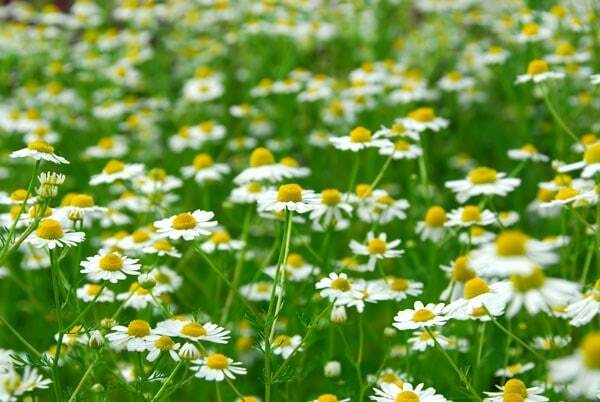 Forming a dense, creeping mat of aromatic leaves, which are topped with wonderful, white, daisy-like flowers in summer, this flowering chamomile is perfect for sunny, well-drained areas of the herb garden. A valuable medicinal herb, the flowers can be dried and used to make chamomile tea or potpourri. Garden care:Gently firm the seeds into the surface of good seed compost and thin when large enough to handle, transplanting into individual pots or planting out into a well prepared seed bed. Alternatively sow direct into a weed-free bed that has a very fine tilth, which has been firmed and levelled. Mix the very fine seed with sand, and allowing one packet of seeds per square metre, distribute the seed. Leave uncovered and water in using a fine spray. Do not allow the soil to dry out, but avoid excessively wet conditions. You may need to protect the area from birds as they may eat the seed. Thin to 30cm (or 10-15cm if you want a more immediate effect), and cut back the plants to encourage bushier growth. When watering, it is best to give the plants a really thorough soak when the soil gets dry, rather than applying a little water every day. Can I grow moss or chamomile between my paving slabs? How can I grow moss or chamomile in between the slabs of my patio?